Cia was my most in-depth and complex costume to date! It all started when I first laid eyes on Cia’s official artwork. I instantly fell in love with her design. It was dark, seductive and unrestrained- a winning combination in my book! 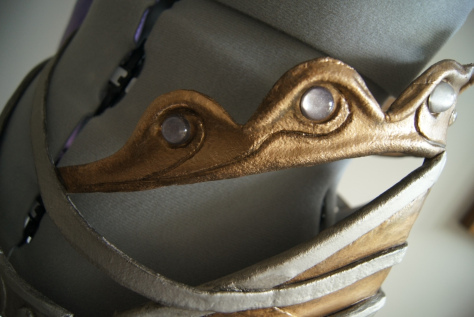 To start off with, we’ll look at the armor-ish metally bits. I made them with the same techniques I make all my armor with, craft foam and Worbla! 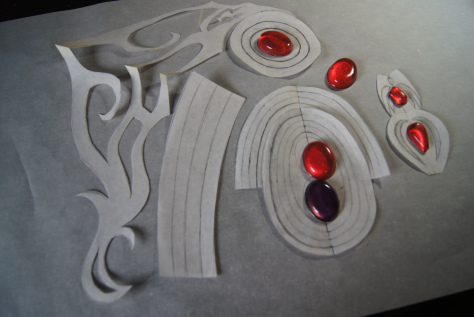 First, I make a pattern for pieces by drawing them out on paper, then I transfer the patterns onto craft foam, cut them out, and cover with Worbla. 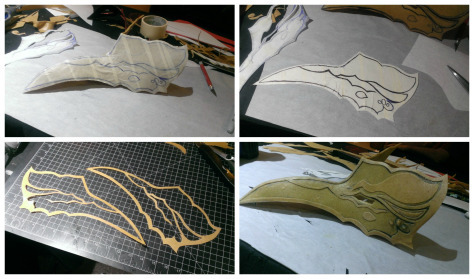 Most details are made either with foam before the Worbla is added or afterwards with just more Worbla. 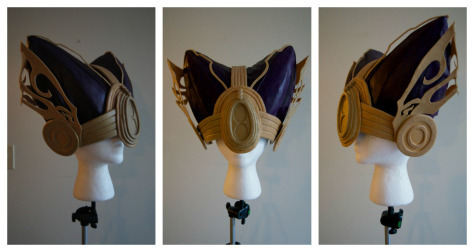 For the details on the mask, I made a pattern by covering the mask with masking tape, drawing on the details, and transferring the pattern to a single sheet of Worbla. Sometimes I use Apoxie Sculpt for the details instead! 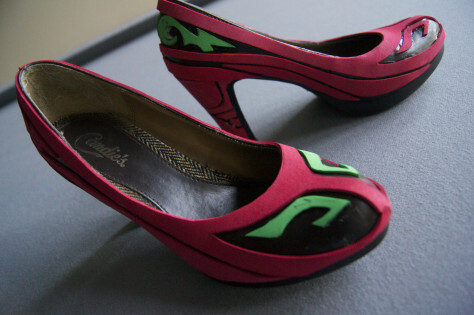 Next we move onto the shoes. If you want to see detailed tutorial on how I made them look on my Facebook page. 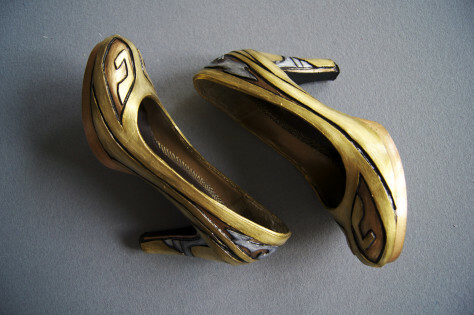 Basically, I altered a pair of heels by patterning out craft foam details and glueing them on. 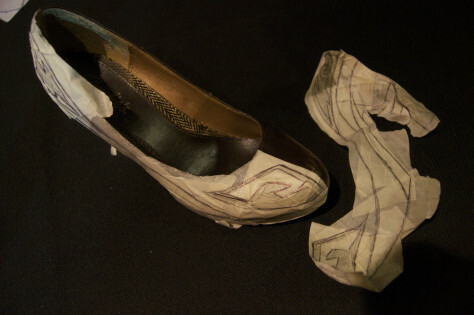 I used fabric glue to attach everything, and coated them with Mod Podge to seal them, and painted with acrylic paints. 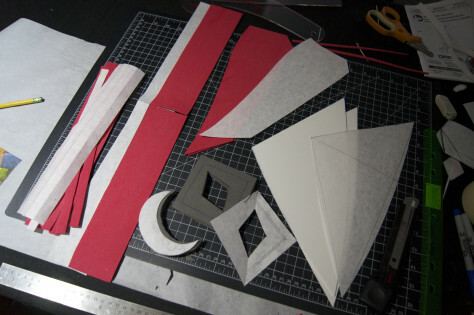 To make the hat, I started by making a base out of craft foam and foam board. Then I filled the points I formed out of foam board with expanding foam and let it cure. 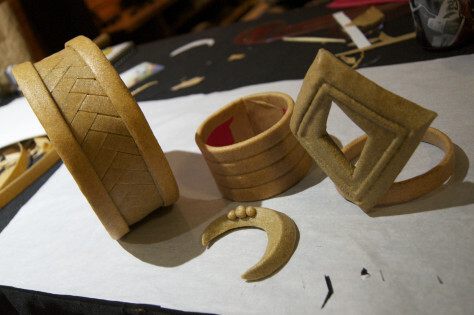 Once cure, I carved out their shapes. 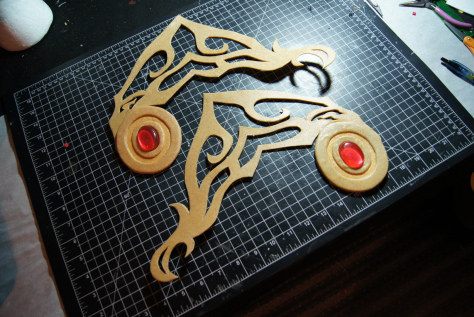 I also made the metal looking parts out of craft foam, EVA foam, and Worbla. 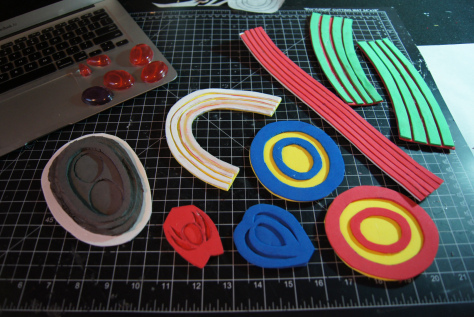 Like always, I started with a paper pattern, transferred to foam, and then covered with Worba. 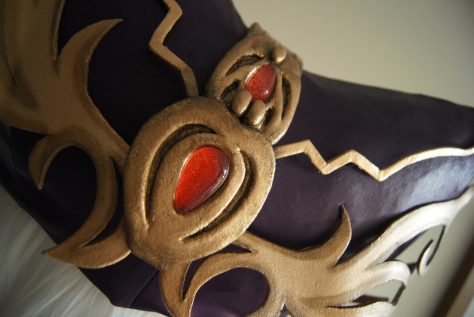 The filigree details on the sides were cut from a double layer thick piece of Worbla. 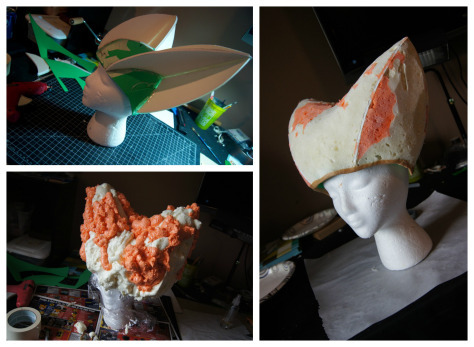 To put everything together, I covered the hat shape with fabric, and attached the Worbla pieces on with neodymium magnets. 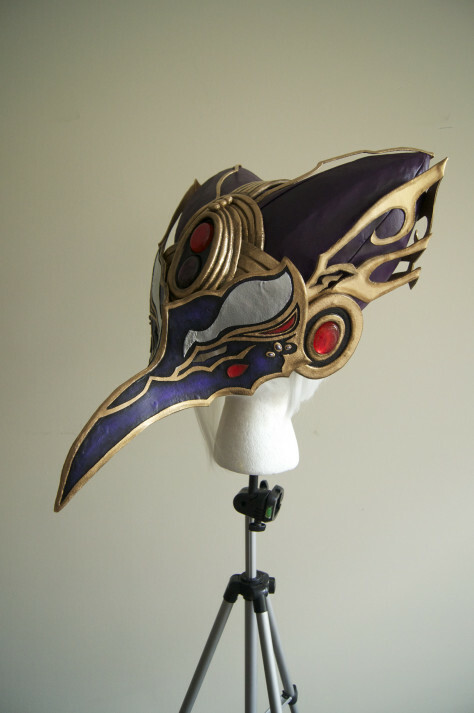 I wanted to be able to take the hat apart so I could prime and paint it easily, and magnets worked perfectly for this! 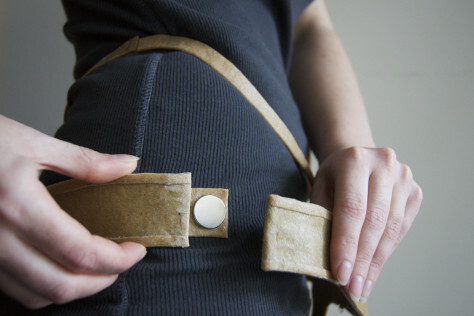 I used magnets to hold on almost all of my armor pieces, including the belts! To prime my armor, I used a spray primer, and I didn’t bother to try and smooth it. 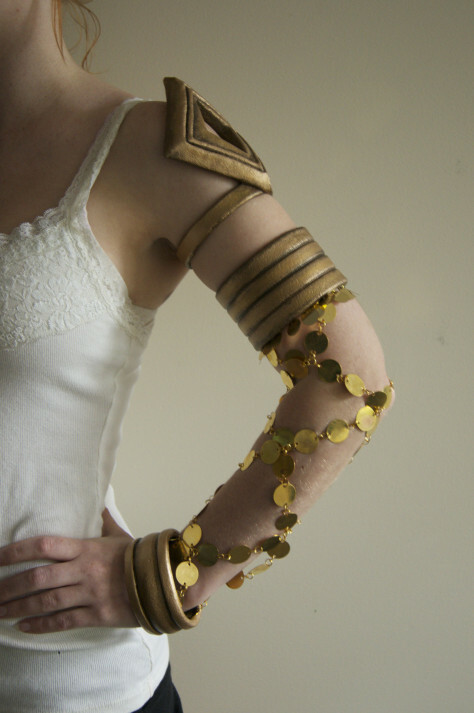 The Worbla texture didn’t bother me at all for this project, so I left it. 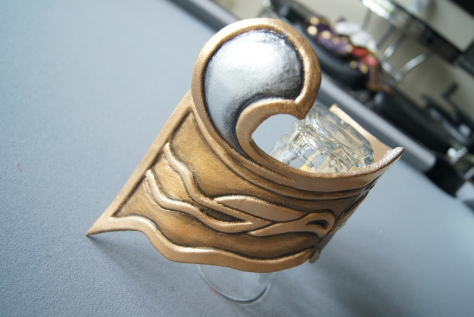 As for paint, used metallic spray paints to give it a base color and I weathered with acrylic paints. 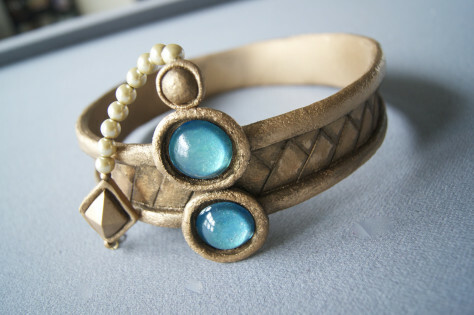 Last, I added in gems that I cast from resin. 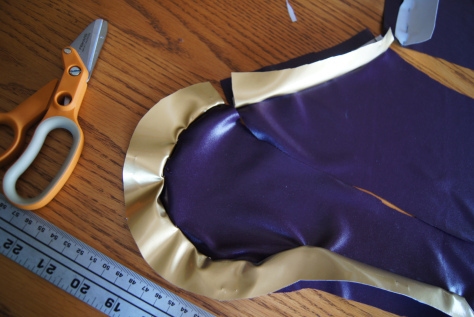 The fabric parts of the costume were definitely the hardest for me. The project was way over my skill level when I started, and I ended up hating my first attempt at the bodysuit. Eventually though, I leveled up enough to where I was able to make something I was ok with. I used an existing bodysuit pattern and altered it to look like Cia’s costume. 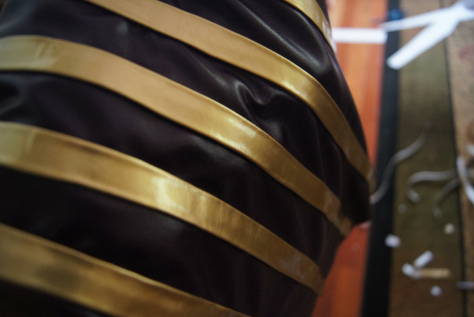 I used gold stretch vinyl to make the trim and the stripes, and I had to hand sew each stripe on individually to the bodysuit. 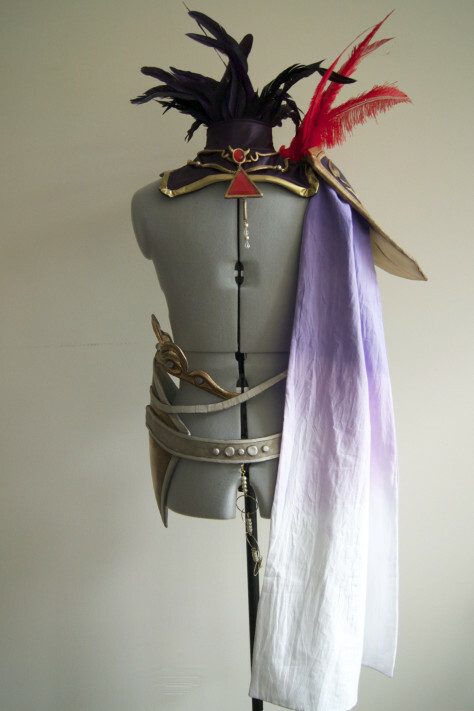 The cape was actually dyed to the white/purple gradient for me by a friend, and I simply made a rectanglular shape with the fabric and attached it with magnets to the inside of the pauldron. 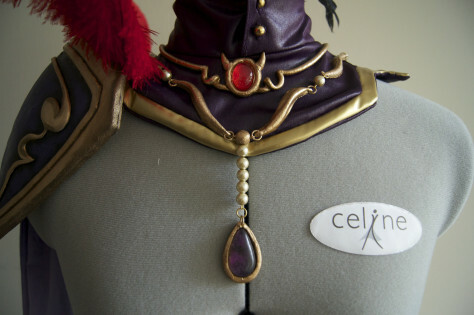 I also made the feathers on the pauldron detachable by glueing them to a piece of Worbla and attaching the Worbla with velcro. 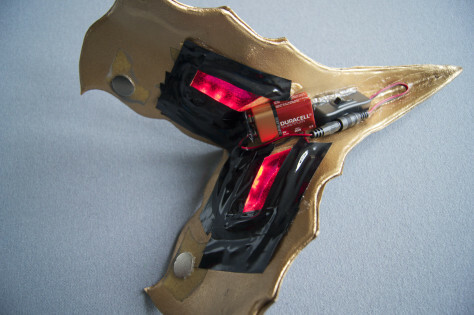 Lastly, I added LEDs to the inside of the mask to make the eyes glow red. I really don’t know much about LED work, and I had help installing and wiring the LEDs together. There are three red LED’s that shine down into each of the eye holes. 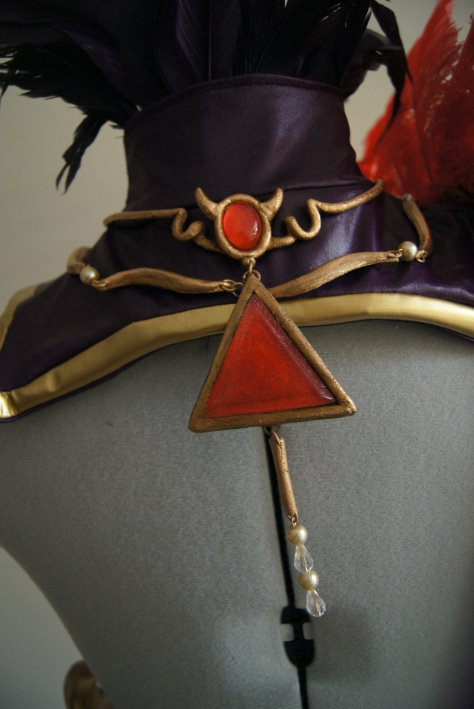 To make the red translucent piece that sits over the eye hole, I actually used resin! I cast a very thin piece, formed it to take the shape of the inside of the mask before it fully cured, and attached it to the inside of the mask with Worbla. 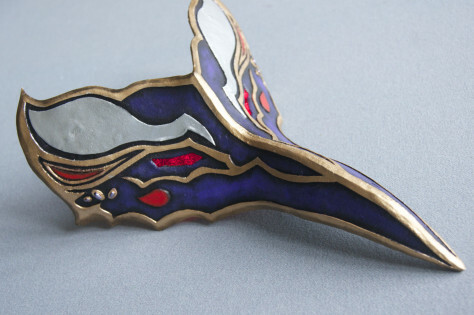 Now here’s a look at some more of the finished pieces! 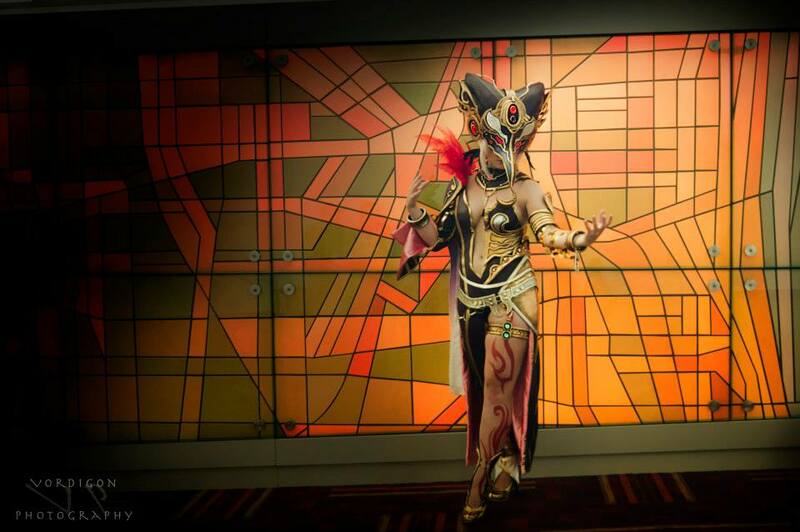 Thanks again to Termina Cosplay for sharing this build with us!